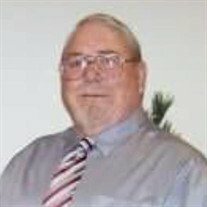 Scotty J. Walker, 74, of Irving, Illinois, formerly of Brownstown, Illinois, passed away Sunday, September 30, 2018, at his residence, Irving, IL. Memorial Services will be held at 10:00 AM, Saturday, October 6, 2018, at Bethel Baptist Church, Rural Vandalia, with Rev. Richard Hill, officiating. Burial will follow at Mount Carmel Cemetery, Rural Ramsey, IL. Visitation will be held from 9:00 AM to 10:00 AM, 1 hr. prior to the service Saturday, October 6, 2018, at the church. Memorials: Mt. Carmel Cemetery, Rural Ramsey, IL. He was born April 29, 1944, in Highland, IL, the son of Edgar Oscar & Mildred Louise (Wilds) Walker. Married Joyce Arlene (Hill) Robbins on June 14, 1974, Vandalia, IL. He was Owner/Operator of Walker Trucking, Irving, IL; Truck Driver; and US Army Veteran. Preceded in death by: Parents; 3 Brothers; 2 Sisters; and Daughter - Malinda.